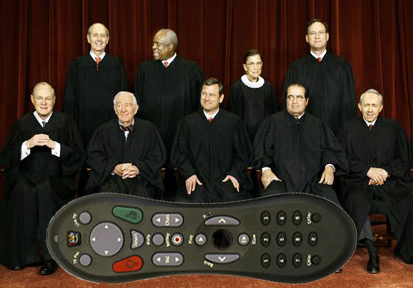 Well, it’s finally happened–a US Supreme Court decision that affects the world of non-linear editing. Perhaps I exaggerate. But on Monday the court let stand a lower court ruling that allows cable TV operators to market network DVRs. The idea is that you’d simply identify the show you want recorded and the recording would take place on the cable company’s servers. No longer would you need a local hard drive to record or play back material–your existing cable box would do it all. This will inevitably make DVR technology cheaper and more widely deployed. Those of you who have “on-demand” service for selected programs know how convenient it is. This creates the possibility of on-demand service for everything and puts another nail in the coffin of scheduled television. Watch whatever you want, whenever you want, for less money with less hassle and no special equipment. Needless to say, the networks opposed the decision. This entry was posted on June 30, 2009 at 6:37 am and is filed under Media and Society. You can subscribe via RSS 2.0 feed to this post's comments. You can comment below, or link to this permanent URL from your own site. This just bothers me from a technical point of view. At least with a standard DVR, the recording is in my home, and I can watch it whenever I want, even if something goes wrong with my cable connection after it’s been recorded. It bothers me that I would have to be “connected” to my cable company at all times in order to watch everything on my TV. What’s next? I’d have to have a Kindle that constantly has a Wi-Fi connection on in order to read a book? There’s a thrill that goes with catching a show on scheduled television I don’t get when I have a recording. There was a comment on the Mark and Brian show (KLOS) the other day, how it really feels like Christmas when the Charlie Brown special airs, but it’s not the same when you have it on DVD and can play it anytime you want. The world is with you as you watch, or you watch alone. There’s a certain social gratification to scheduled programming, so I don’t think it will go away soon.